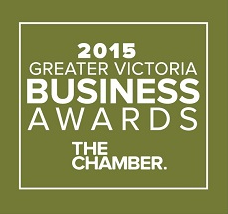 Congratulations to all of the incredible businesses who were nominated, the finalists and ultimately the winners of this year's 2015 Greater Victoria Business Awards. If you weren't able to join us for the gala event at The Fairmont Empress, you will be able to enjoy the evening vicariously. Watch these great videos of our finalists here. To get a digital copy of our program guide -click here. The 2015 Awards Gala sold out in record time, to make sure that you don't miss next year's celebration of Victoria's movers and shakers, click here to reserve. Outstanding Customer Service; sponsored by Technology Guys IT Solutions Inc.